The sixth annual 30A Wine Festival, benefiting the Children’s Volunteer Health Network, is scheduled for March 9-12, 2017 in the beautiful community of Alys Beach. This highly anticipated event offers a wide selection of wines from some of the finest vintners as well as local culinary delectables guaranteed to impress the palate. The four day event starts off on Thursday, March 9th with a special wine dinner at the Red Loggia at the Caliza Pool and featuring Aaron Potts of Potts Winery. The menu, created and prepared by Alys Beach Executive Chef Drew Dzehak and complementing the selected wine pairings from Pott Wines, promises to sell out, as tickets are limited. On Friday evening, the festival continues with Sip ‘n Slide into Bourbon, Beer & Butts, at the Fire Pit Park in Alys Beach hosted by Richard Stabile, Master Distiller of New York’s farm to bottle distillery, Long Island Spirits, and followed by Bourbon, Beer & Butts a night of bourbon, beer and barbecue at the Kelly Green at Alys Beach with the Sam Bush Band providing plentiful music throughout the night. Saturday afternoon, from 1:00-3:30, attendees will join some of the nation’s best vintners for wine tastings as well as plentiful hors d’oeuvres, at the Fire Pit Park. The Grand Tasting occurs immediately afterwards, from 3:30 until 7:00pm at South Charles Street where more than 80 wines from around the world will be showcased as well as local restaurants offering small bites. Finally, on Sunday, the popular Rose and Croquet commences at the Kelly’s Green where you will gather in your smart white attire and enjoy a croquet tournament while sipping refreshing and elegant roses. Tickets may be purchased online or locally at Alys Beach Bike Shop, Fonville Press and Neat Bottle Shop and Tasting Room. Different ticket packages are available for the entire weekend or selected events with proceeds benefiting the Children’s Volunteer Health Network. This organization facilitates free immediate medical, dental, vision and mental health care for uninsured or under-insured children from Crestview, Destin, Freeport, Fort Walton Beach, DeFuniak Springs, Milton, Santa Rosa Beach and everyplace in between, according to its website. Alys Beach is a luxurious seaside community located along the Florida Panhandle on Scenic 30A. Well known for its sugar white sandy beaches, stunning architecture, winding trails and low key yet elegant lifestyle some of South Walton County’s most gorgeous homes are here. One such property, located in the heart of Alys Beach at 140 N. Charles Street, and recently listed by Scenic Sotheby’s International Realty, is this stunning 6,880 square foot compound designed by the renowned Tom Christ of Christ and Associates. This exclusive 6 bedroom, 7.5 bath property boasts two master suites, kid’s bunk room, five fireplaces, breakfast bar and formal dining room all surrounded by high end quality materials such as Calcutta gold marble, coral stone tiled flooring, white Venetian plaster walls, and high beamed ceilings offering an abundance of natural light contributing to the open feel of the property. The unparalleled amenities include an outstanding outdoor living and entertainment space with a 42 foot saltwater pool with underwater music, outdoor fireplace, two outdoor dining areas, gas grill and wet bar. The estate also offers a two bedroom cabana with a separate fireplace, mini kitchen and two full baths. Click here to learn more about 140 N. Charles Street. 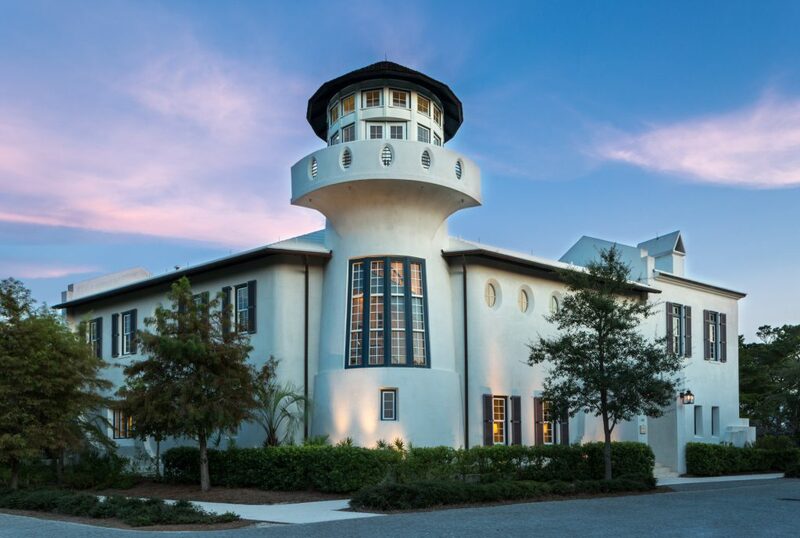 Scenic Sotheby’s International Realty specializes in the listing and marketing of Alys Beach homes for sale with an outstanding portfolio of one of a kind homes for those looking for something beyond the ordinary. Click here to learn more about Alys Beach real estate.